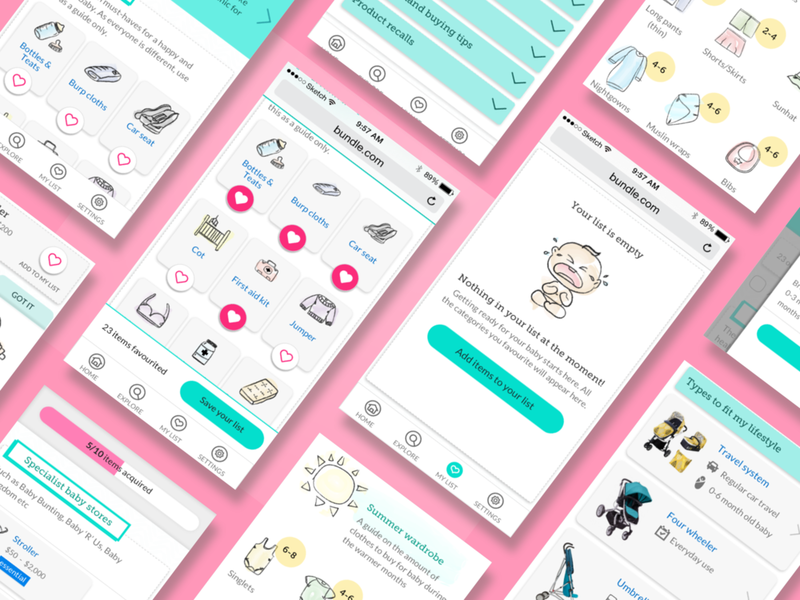 Bundle gives independent, practical advice, so first-time parents can get the right products for their needs. We spoke to mums and dads about their experiences researching baby products. We learned that it’s an overwhelming experience. There is no shortage of information and advice available. Yet much of it is conflicting, confusing and not considerate of their own needs. Information sources range from online searches, online forums, Facebook groups, friends/family, books, to shopping centres. Keeping track of research can be messy and ad-hoc. It can take form of hand-drawn notes, SMS or email trails, website bookmarks, spreadsheets, to Trello. Expensive items (e.g. prams, cots, car seats) are high on the list of confusing purchases. But there are also more questions they have along the way. Specifically - "what do I really need?" The core team took an agile approach. We worked on the rhythm of two-weeks sprints of rapid prototyping and testing. We had regular customer interviews and users testing sessions. This was to gauge early feedback and respond accordingly. We followed the Design Sprint method. It outlined a five-day process of design, prototyping, and testing ideas with customers. It was an interesting and useful process for answering critical business questions. The team took on the Crazy 8s exercise - a core sprint method for quick idea generation. It’s a fast sketching exercise that challenges people to sketch 8 ideas in 8 minutes. We discussed the ideas and vote on the one we thought work best for the product. I mapped out each step of the experience that we wanted to test. This helps clarify the pieces we needed to prototype and the full customer experience. Based on the storyboard I mocked up the different screens for the app. Josh, our interactive designer/prototyper then turned them into an interactive prototype in Framer. We took our prototype to a shopping centre that has a few baby shops. We approached some young mums to ask them to go through the prototype. We gleaned their impressions on the product and its usability. Seeing the positive user reaction on the prototype, we were confident we were on the right track. I sketched out a content framework to answer most common questions. We worked on developing the content for six key categories out of over 130 products. The web app was launched to a closed beta group in September 2017. We recruited participants through personal networks and the CHOICE social pages. We engaged participants to get valuable feedback through a closed Facebook group. First-time parents value a single source-of-truth to tell them what they need and what they don't. Keeping track of items and sharing features are frequently used. Users love the short, practical advice for each product and the app's warm tone of voice.